CRISPR/Cas9-mediated gene editing is a powerful technique that allows you to create knock-in/out mutations in any gene and any cell. CRISPR/Cas9 is advantageous over other forms of gene editing, such as TALENs and zinc finger nucleases, because it is simpler to implement and edits at higher efficiency. GenScript licenses CRISPR technology from the Broad Institute of MIT and Harvard. Our offerings include the latest CRISPR plasmids and databases developed by the CRISPR pioneering Feng Zhang laboratory. Broad Institute-validated plasmids are a well-tested platform for expressing CRISPR/Cas9, and avoid instability issues in RNA-based platforms. Reference: Sanjana et al., Nat Methods. 2014 Aug;11(8):783-4. doi: 10.1038/nmeth.3047. SpCas9/sgRNAs can be mutually expressed in all-in-one vectors or separately expressed in dual vectors. The optimal on-target SpCas9 PAM sequence is NGG. SpCas9 also contains on-target affinity for NGA sequences. SpCas9 nickase (Cas9n D10A) contains a mutation allowing the endonuclease to create single-strand nicks, as opposed to DSBs. Pairing two opposite facing gRNA sequences with SpCas9 nickase is an efficient method of gene editing that prevents unwanted indels from forming. The optimal on-target SaCas9 PAM sequence is NNGRRT. SaCas9 also contains significant on-target affinity for NNGRRN. The SAM complex is comprised of three components: a gRNA incorporating two MS2 RNA aptamers, a catalytically inactive dCas9-VP64 fusion protein, and a MS2-P65-HSF1 activator fusion protein. The SAM system is capable of activation of both coding and non-coding genetic elements. To search for Broad Institute pre-validated SAM gRNA sequences, visit our guide RNA Database. Broad Institute Plasmids are generated by the Broad Institute of Harvard and MIT. These plasmids contain a 17bp-1.8kb expressible linker in lieu of a customized sgRNA sequence, which can be modified by your laboratory. Cas9 endonucleases derived from the type II CRISPR systems in S. pyogenes (SpCas9) were the first Cas9 enzymes developed for mammalian genome editing. When combined with guide RNA (gRNA) sequences, these enzymes create site-specific double strand breaks (DSBs) in the genome. The CRISPR/Cas9 system accelerated genome editing for its ease of use, specificity, and high efficiency. GenScript is pleased to offer Broad Institute-validated WT SpCas9 constructs for gene editing in mammalian cells. Constructs are available either as all-in-one or dual vector systems, and can be used for non-viral, lenti-viral or adeno-associated virus (AAV) transfection. The lenti-vectors are compatible with 2nd and 3rd generation lentiviral packaging plasmids. While the CRISPR/Cas9 technology is still more specific when compared to other popular gene editing strategies, off-targeting concerns are still a reality. In an effort to improve specificity, the endonuclease activity of Cas9 was modified. WT Cas9 has two catalytic domains, RuvC and HNH, and mutations to catalytic residues within these domains (specifically, D10A in RuvC and H840A in HNH) cause Cas9 to create single strand nicks as opposed to double strand breaks (Ran et al, 2013). This Cas9 enzyme with nickase activity, or Cas9n, is guided by guide RNAs (gRNA) to opposite sides of the target genomic DNA. Cells will preferentially repair these SSBs by HDR rather than NHEJ. By proceeding through an HDR mechanism, the frequency of unwanted indel mutations from off-target DSBs is minimized. GenScript is pleased to offer Broad-validated nickase vectors for gene editing in mammalian cells types. The Cas9 orthologue derived from Staphylococcus aureus, or SaCas9, has similar efficiency to SpCas9; however, SaCas9 is approximately 1kb shorter. The primary advantage of SaCas9 is adeno-associated virus (AAV) packaging: the cargo size of AAV is approximately 4.5kb, and consequently packaging SpCas9 into this vector can be challenging (Ran et al, 2015). 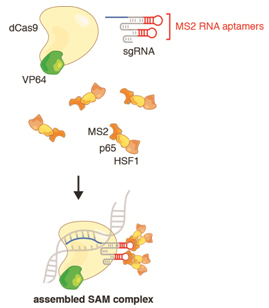 The relatively smaller size of SaCas9 makes CRISPR gene editing with AAV vectors possible. Considering the lower immunogenicity of these constructs, SaCas9 is therefore more suited for in vivo editing applications, such as for therapeutics. CRISPR/Cas9 Synergistic Activation Mediator (SAM) is a protein complex engineered to enable robust transcriptional activation of endogenous genes – either a single gene at a time, or up to 10 genes simultaneously in the same cell. SAM takes advantage of the specificity and ease of reprogramming of Cas9 nucleases, which are targeted to a specific locus in the endogenous genome by guide RNA. Through a license with the Broad Institute*, GenScript offers validated SAM gRNA sequences to target any coding region in the human genome, as well as complimentary design of SAM gRNA for any other species. SAM guide RNA sequences are custom-synthesized and cloned into efficient lentiviral vectors, and accompanied by the Cas9-VP64 and MS2-P65-HSF1 components that form the three-part SAM complex. An sgRNA incorporating two MS2 RNA aptamers at the tetraloop and stem-loop: the sgRNA should be designed to target the first 200 bp upstream of the transcription start site in order to target the SAM complex for ideal transcription activation. While sgRNA normally binds to Cas9, the MS2 RNA aptamers are required to allow the third member of the SAM complex to bind to the Cas9-sgRNA complex. The MS2-P65-HSF1 activation helper protein: this contains two transcription activation domains, P65 and HSF1, that synergize with VP64 to robustly activate transcription of downstream coding regions. The MS2 domain allows his helper protein to bind to the sgRNA-dCas9 complex. A minimum of 3 gRNA sequences are recommended to ensure knock-out and experimental accuracy. Independently obtained knock-out mutants provide redundancy to safeguard against any hidden off-target effects. Selecting gRNAs sequences that lie within your preferred binding region. GenScript's gRNA database and online design tool will take out much of the guesswork when you're choosing gRNA sequences, by providing off-target scores and chromosomal location. Vector selection for CRISPR gene editing should consider both application and cell type. In most easy-to-transfect cell lines non- viral vectors can work well. Lentiviral transfection is typically necessary in cells with low transient transfection efficiency, such as primary cell cultures or hard-to-transfect cell lines. AAV vectors have low immunogenicity and are preferred for in vivo gene delivery. Since the cargo limit of AAV vectors is generally smaller than other vectors (<5 kb), packaging the SpCas9 gene into these vectors can be challenging. The Staphylococcus aureus Cas9 orthologue (SaCas9) is smaller than SpCas9 and is the preferred Cas9 variant for AAV vectors. SpCas9 nickase vectors are advantageous to use in experiments which are more sensitive to off-target editing. However, it is important to remember, that two gRNAs will need to be designed to target both forward and reverse strands. These gRNAs must be oriented so that PAM sites are distal to each other. gRNA sequences should be offset with windows of up to 100bp between them. How are gRNA sequences designed for the transcription activation (SAM) system? For robust SAM transcription activation, gRNAs must target the first 200bp upstream of the transcription start site (TSS). To decrease the degree of transcription activation, design gRNAs that target the SAM complex to greater distances upstream of the TSS. To repress transcription, design gRNAs that target SAM to +50 relative to the TSS, which will effectively block the TSS. GenScript maintains a genome-wide SAM gRNA database which contains 6 SAM gRNAs designed to activate each coding region of the human genome. For other species, our scientists offer complimentary SAM gRNA design help. Request custom SAM gRNA design here.